Discussion in 'Level 10-19' started by Purj, Jan 14, 2019. This will be a small list, as there are not that many changes in this bracket. I will update with the new Allied Races racials once their tooltips are displaying correctly. 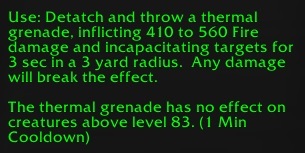 Most proc based enchants have been reduced. The values of these are not exact, as most of them scale with Versatility and will be slightly different for each person. The amount of damage done is also in a PvE environment. This does not take into the account the damage reduction against players due to Versatility. These values are based on my Shaman's 18% vers rate. 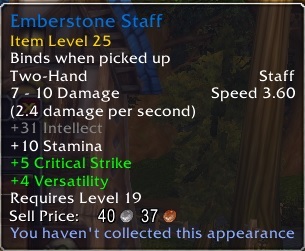 Blue items (from quests and dungeon drops) now scaling to ilvl 25. **Currently automatically updating to ilvl 25 if you already have the ilvl 23 version. Older lower/higher ilvl versions are unchanged. I'm not going to screenshot all 100 Dungeon drop items, but there are some small stat increases on most items. This includes the Slither-Scale and Fang sets. You DOT NOT need to re-farm BoP items from dungeons. They are automatically scaling up as of this moment. My sliter-scale set is entirely upgraded to ilvl 25 and has better stats. ilvl 23 Shadowfang likely scales to ilvl 25. I say this because my ilvl 23 Petrified Shinebone I just bought off AH (ilvl 23 on live) scaled to ilvl 25 on PTR. * stats to bracers (currently tooltip shows +1 stats, but gives +2 stats) is also nerfed on PTR to actually give +1. * other chest enchants are nerfed as well, so glorious stats is still the best stats enchant. But it does open up other options - I believe theres a verse chant that might be considered now. 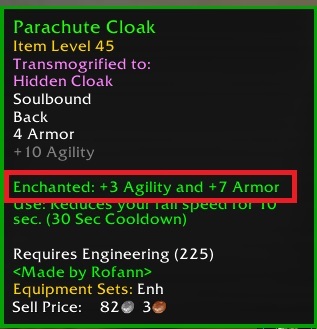 * I believe shadow armor is also getting nerfed - so stealth will now be the BiS agility enchant. * Elemental Force - Nerfs rogues, mages, boomkin, offensive healers, and surv hunters. Also makes it so that less viable specs (WW, lock, enhance, etc) are even less viable. Buff by proxy to warriors/ret/mm/BM. We might see landslide or mongoose or other enchants come back into play a bit. * Coastal Surge - An extra hot is still nice for some classes. May want to go back to +spellpower though for pure throughput. Remains to be seen and may depend on class. I wonder if incendiary ammo was nerfed? I updated the list with some of the enchants you touched on. Furthermore, I tested +9 SP vs Ele Force. The +9 SP gave my Flameshock +7 damage on the instant and +66 damage on the DoT. Elemental Force proc'd from Flameshock once vs one target (34 damage) and twice vs another (68 damage total). Spellpower is likely better overall via throughput numbers (healing & damage in my case). Although the RNG nature of Ele Force could still produce better burst if luck is on your side. In queue for a satchel now. Satchels are still ilvl 23 on PTR. Updated OP with Frag Belt nerf. i hope so i am getting bored of ele force . Quick question guys , what happened to crusader ? i hope it gets nerfed too . So far, nothing has changed. Still procs 100 Strength. So far, nothing has changed. Its probably a bug, as Crusader has been untouched since Vanilla. 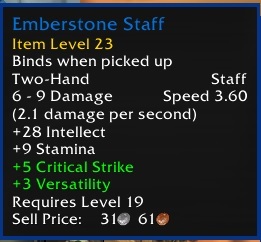 Even though the tooltip currently shows 33 Strength on live, it still gives 100 Strength. As Necroaqua stated, it does not appear to have been fixed on PTRs. Oof, healers going to be rough to deal with. Good news is that healers with elemental force won't deal as an absurd amount of damage. The bad news is that damage is getting nerfed basically across the board and healers will be even harder to kill. 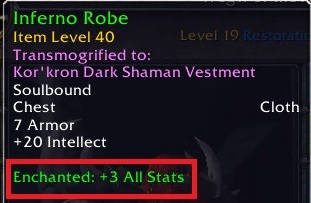 Do you know the ilvl of blue quest items at lvl 29? I cant even see a reason why this time, either. 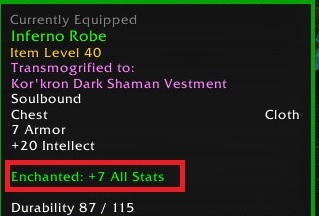 I get fixing the overscaling/procs, but why boost any ilvl now? Pointless. If I had to venture a guess, it may be to boost the power of levelers. 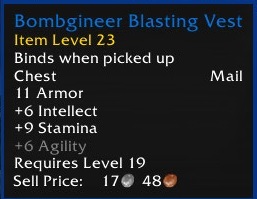 Boost up their questing gear slightly and nerf our enchants slightly, so the power gap isnt as wide. This makes levelers feel like they have a better chance, and we twinks get to stay in the merged queues and have better queue times. If you are planning on obtaining any blue quest items, wait until the new patch, as old versions do not scale up. 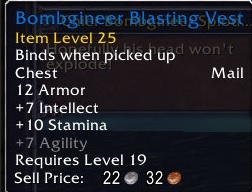 Doesn't hurt to wait, but quest gear you get now should go up to 25 after the patch. 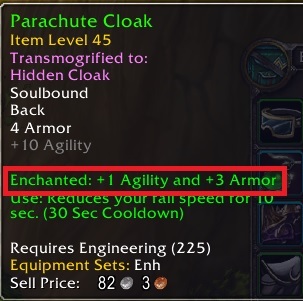 Looks like just items from before scaling in 7.3.5 that won't change. One pretty easy way to get a rough idea how they stack up is to look at your damage breakdown in BGs with ele force. You can compare the % damage you get from ele force with the % your spellpower would increase with a weapon enchant. 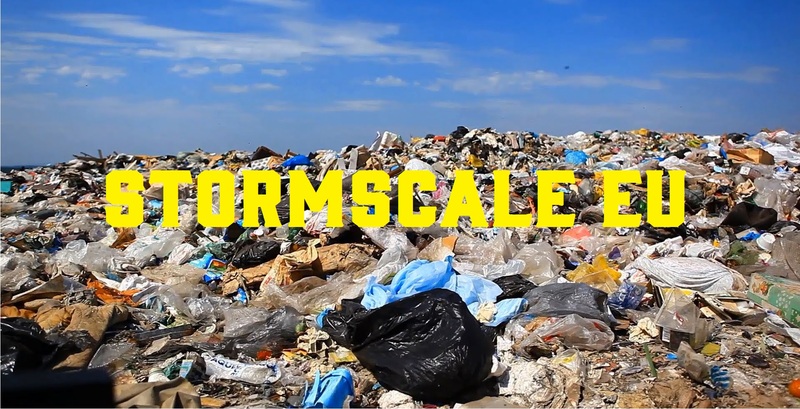 It's a decent approximation for overall damage since spells all scale linearly with SP now. If it's in the same ballpark, you can factor in stuff like SP affecting heals, Ele Force doing its full damage passively if you have dots up, etc. Hopefully it's close enough to give people some variety. Blue quest rewards will be +6 ilevels at every level, up to 60 at least. You can see the scaling on PTR wowhead. 29s will get ilevel 35 gear. If I had to venture a guess, it may be to boost the power of levelers. But by the time they get those items, the rest of their gear will already be last bracket, and lets face it... 1 more int isn't doing anything for a leveler. They'll get far more dungeon rewards than blue quest items, yet only quests are buffed. Sounds accidental, I doubt they intend to buff anything.